My name is is Kaila. I'm 28 years old from North Bay, Ontario and I'm a Lambton College Business Administration - Accounting grad. I came from a very broken home. I moved out before I was 14, I dropped out at 16 and I got myself my very first place at 17. Going back to school was a hard decision. Going back at 25 without my high school diploma certainly had its challenges. 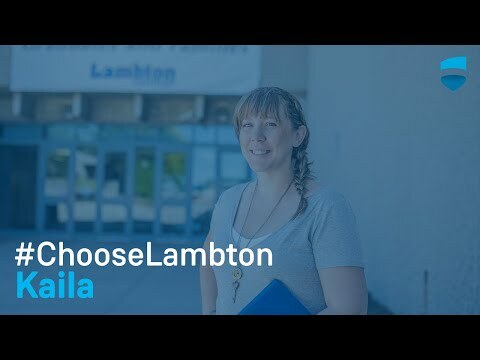 But I choose Lambton because education is important. As a student I learned about a peanut butter factory being built in Zambia with Lambton College support. This factory is bringing people out of poverty and malnourishment and up the value chain. They've learned better farming practices creating higher yield and are now using manufacturing and business skills to create their own success. The factory is altering the future for rural Zambians and I am a part of that. I feel confident and strong, with goals and career options that I wouldn't have had before. Education gave me the power to do all of it. Life has all kinds of obstacles and just like the people of Zambia, I want to be the success story in my family. The one who broke the chain in the cycle. I want to show that it is possible.